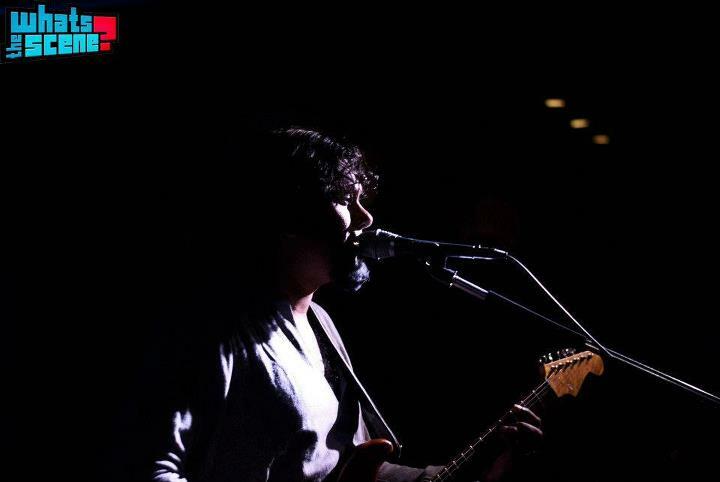 The Explosive TAAQ Sizzles The BFlat Bar, Bangalore | WhatsTheScene? Thermal and a Quarter is arguably one of India’s most successful and talented bands. Success of course doesn’t come without hard work and boy does this band work hard! Bruce and the gang who recently got back from their Singapore/US tour are recording their new album called Three Wheels Nine Lives and are playing explosive gigs such as the one in BFlat on 16 June 2012. I must say that I was one of the privileged few to have experienced such a mind blowing performance. I ran into Ramanan Chandramouli, LA Music Academy graduate and a faculty at Taaqademy, who acknowledged that this was the best Thermal gig he had witnessed in recent times. The sound at BFlat was marvellous as always and beautifully complimented the band’s technical versatility. As I was sitting at the bar counter waiting for the gig to start, I saw Bruce Lee Mani get up on stage armed with his guitar and ready to belt out a tune all by himself. The floor was jam packed with TAAQ fans eagerly waiting for the show to begin. Bruce dedicated the first song ‘Terrible Trouble’ to his wife who was among the audience. The song was about his father-in-law, who belongs to a very different cultural and religious background from Bruce. The lyrics were funny and showcased Bruce’s tasteful song writing skills. The amazing Prakash K.N and the dexterous Rajeev Rajagopal joined Bruce and the mighty Thermal and a Quarter took stage. They played a mix of old and new tunes such as ‘For the Cat’, ‘De-Arranged’, ‘Mighty Strange’, ‘Aerodynamic’ and ‘Billboard Bride’. The band had performed ‘For the Cat’ (a tribute to Cat Stevens) and ‘Billboard Bride’ ’last November when they had played at this venue and one gets a feeling that each time these songs sound even better. The number of people in The BFlat Bar seemed to be exponentially increasing and every single one of them found themselves grooving to the irresistible Bangalore Rock sound of TAAQ. Next up was ‘If Them Blues’, a song which was preceded by an amazing guitar and bass jam. Then, Thermal belted out their rendition of the classic‘Roxanne’. The breaks in this song were particularly noteworthy showcasing the fascinating tightness the band is famous for. ‘Chainese Item’ was up next and the band started the song very differently as compared to the studio version. The breathtaking stacatto solo was backed by immensely powerful drumming. After this song, Bruce wished all the people who were celebrating their birthdays before launching into the next tune, ‘Birthday’. The rhythm section during the guitar solo section of this song was particularly interesting as Prakash played chords on his 6-string bass guitar remarkably complementing Bruce. It was interesting to note that the audience consisted of people from varying age groups ranging from college kids who were standing right in front of the stage to 50 year olds who were comfortably seated in sofas. By the time the band started ‘Jupiter Cafe’, the crowd was in full swing getting steadily high on Thermal. TAAQ plays ‘Jupiter Cafe’ differently each time they play it and I strongly feel that this was by far the best performance of the song by the band. The trio started the song with an elaborate jam session with Prakash playing a lot of harmonics on his bass while Rajeev displayed some very clever use of cymbals. The crowd sang the entire song, including the solo section, along with Bruce. Next up was ‘Meter Mele One and a Half’, a song whose opening lines were “three wheels and nine lives”. This song with a dangerously catchy chorus is about auto rickshaws in Bangalore. The versatile use of the cowbell by Rajeev impressed the audience and Bruce’s stegatto solo in this song was par excellence. Thermal’s music cuts across boundaries and reaches across to a vast audience creating a cross cultural connection. The band has received tremendous success during their US tour making them one of India’s very few acts to have won accolades overseas. The band proceeded to finish the set with ‘Won’t stop’, ‘In the Middle’ and ‘Dangerous Mind’. I must say there were a couple of awkward pauses in the last song which gave one a feeling that somebody had messed up something but the trio quickly covered up their mistakes. When it was finally time for the band to call it a day, the crowd did not let Thermal leave the stage. After a few minutes of loud persuasion, the band finally gave in and played ‘Chameleon’, the last song of the night. The gig was an exhilarating experience which will linger in my head for a long time. Long live Bangalore Rock! Anand Kumar plays bass guitar with a few Bangalore bands on and off. He is a coordinator with Songbound - a music outreach initiative that uses singing to reach out to India’s most impoverished children via collaborative projects with schools, choirs and professional musicians worldwide. His other interests include discovering new music on YouTube and computer programming.